A few weeks ago, my husband Gabe and I had a quick stay in Orlando for a charity event. 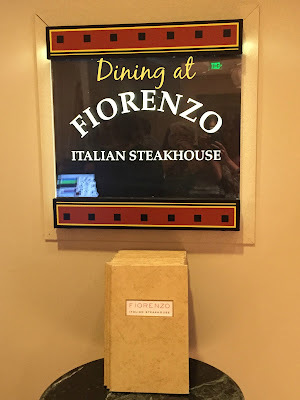 We had no plans on a Friday night and decided to dine at Fiorenzo Italian Steakhouse located in Hyatt Regency Orlando on I-Drive, across the street from the Orange County Convention Center. This low key date night turned into one of the best meals we have had in Orlando. The food was incredible, the staff was professional, polite and knowledgeable. 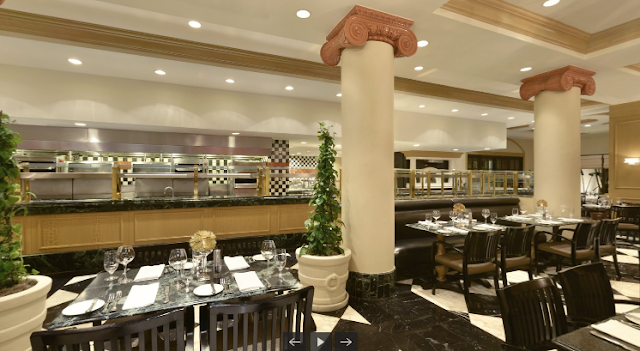 Overall I give Fiorenzo 5 stars and look forward to my next visit. We left our meal in the hands of Fiorenzos Manager Menelik Tefera and Executive Chef Will Walters. They created the menu selection and our amazing server Laura Ardon chose our wine pairings. Knowing the wine was out of my hand, I took a few minutes to look over Fiorenzo's extensive wine list and was very impressed with the selection. They had a large variety of wine in many price points. It was as if Laura could read my mind when the white wine came out - a delicious cold bottle of 2013 Cakebread Chardonnay - AKA my absolute favorite white wine. Laura quickly became my wine BFF. When the appetizer came out, the first thing I thought was this is typically somethign I wouldn't choose - Fried Calamari ($15). After first bite, I immediately took back that thought. This was calamari unlike any other, in fact I will go on record by saying this was the best calamari we've ever had. What set this apart was the peperoncini rémoulade and an aged balsamic glaze. It had a perfect light and crispy batter and full of flavor. We were aware a huge meal was coming our way but that didn't stop us from stuffing our faces with the appetizer. Up next were salads. One great thing Fiorenzo does for guests is allows half portions on a variety of dishes. Since we had so much food coming our way, we received smaller versions of the Caprese and the Baby Greens Salad. The Caprese had local heirloom tomatoes with imported buffalo mozzarella, micro basil, aged balsamic, extra virgin olive oil, sea salt and cracked black pepper (full sized portion $16). Gabe devoured it - oh and he doesn't like tomatoes....until this night. He told me this salad changed his view on tomatoes. Now if only Fiorenzo can help me with making him like squash. The Baby Greens Salad had red endive, arugula, frisée, chervil, hazelnut vinaigrette, espelette sunflower seeds, local citrus supreme, robiola bosina cheese and candied hazelnuts (full sized portion $13). The dressing was perfect on this salad and I loved the variety of greens. Plus you can never go wrong when candied hazelnuts are involved. Our second wine pairing came out right before our entrees. This was a new to me bottle - Sequoia Grove Cabernet Sauvignon from Napa Valley. It was absolutely delicious and if you are a Cab fan, I strongly suggest giving this one a try. Our entree's started arriving and boy did we have a ton of food. Gabe received the 20oz Prime Bone-in Rib Eye ($58). I am a filet girl but this Rib Eye could have made me switch steak parties. It was seared and cooked to a perfect medium rare that melted in your mouth. Gabe was freaking out. I am quite sure he swallowed the steak whole as it was gone in less than 5 minutes. Meanwhile, my 8oz Filet Mignon and Scallops arrived to the party. I had a very short love affair with Gabe's steak and I quickly apologized to the filet, giving back my loyalty. The filet has been getting some bad national press lately and is being called as a flavorless meat due to the lack of fat in the cut. 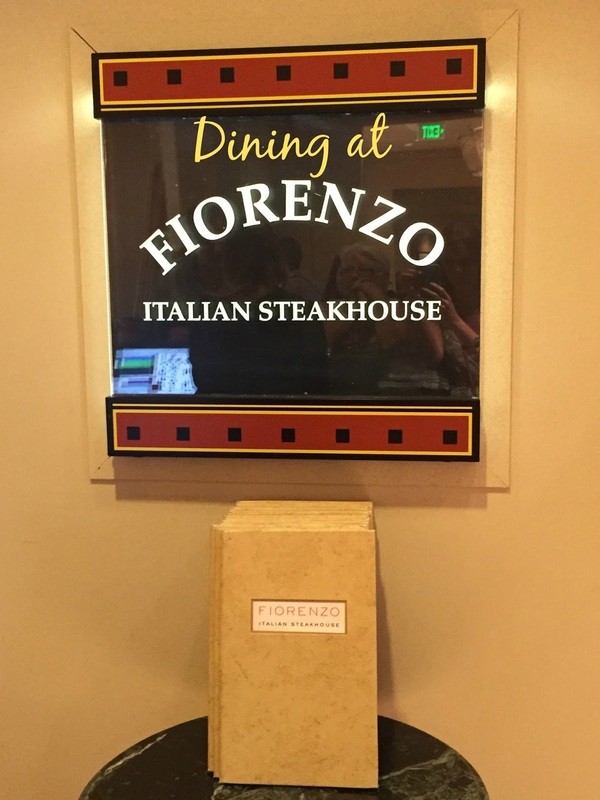 I assure you that anyone stating a filet is flavorless hasn't been to Fiorenzo's. It had a perfect salted charred crust and cut like butter. PERFECTION. Fiorenzo's is known for more than their steaks. The pasta is handmade made locally and they've got a great seafood selection. We got a small portion of the Linguine with jumbo shrimp, crab, roasted garlic, zucchini, fresh peas, tomato, lemon and basil (full size portion $30). The pasta was a perfect al dente and the shrimp delicious. If you find yourself dining at Fiorenzo's, I strongly suggest getting a half order of pasta as your side dish. We also tried the Branzino, a delicate white fish served over roasted cauliflower and red endive with a parsnip puree and cured lemon salmoriglio (full sized portion $36). My full belly could only handle one or two bites of this fish but I would absolutely order it again. Then dessert happened and I considered renting a wheelbarrow back to the hotel as this was the only way to get me from point A to point B. We tried a lovely port to go along with the dessert, a perfect Tiramisu. When we were in Italy, my husband ordered two orders of Tiramisu at this lovely quaint restaurant in Rome. Two. This was the closest thing we've had since that night in Rome. Espresso soaked lady finger cookie with creamy mascarpone - simplicity at it's finest. If you are looking to experience dining at Fiorenzo, be sure to check out Hyatt Regency Prix Fixe Menu. It's an amazing deal, where you get three courses for $55 a person and a wonderful way to try a variety of their delicious dishes. Hyatt Regency Orlando provided this meal to my husband and I. As always, all opinions are my own.